The Yahoo MarvWalkerHorses email list has been replaced by an open Marv Walker Horses Facebook Group. The Yahoo list had been getting less and less traffic since many had gone to Facebook. I resisted the "Facebook!" cries as long as I could because the vast majority of times I was told check out someone's FB page, and I did, it was usually, "SewAnSow only shares their information with friends. Click here to send a friend request." On the rare, and I do mean, rare, occasions, I did send a friend request and was "accepted" the posts were mostly along the lines of, "Took a shower, floor got wet. lol"
Or it was the cutesy, never seem to die, meme du jour after meme du jour seen everywhere you go on FB. I discourage memes and I'd rather have links than "shares" because both encourage original thought and effort. I want the Marv Walker Horses Facebook group, and even my personal page, to dispense right out the box usable information and discussion. You don't even have to be a group member to read the material. You have to be a group member to comment and I'll add you the moment I see your request to join unless I believe you are a spammer or someone who cannot use English. Nothing personal, I only speak English and Gibberish and I just won't have anything I can't read and understand on the group. Information is vital in everything you do. The more you know, the more informed decisions you can make. No where is that more important than in the world of horses. The Marv Walker Horses FB discussion list is a community type forum for horse lovers who want to broaden their horse knowledge base and are willing to help others do the same. The list members possess a WIDE range of experiences and knowledge. We freely examine horse concepts, practices and ideas in hopes of reaching a common truth that will increase our enjoyment of horses. If it is horse related, it is allowed on the Marv Walker Horses discussion FB group. Topics are freely discussed until a conclusion is reached or the thread dies of boredom. Actually, since one should know the general thought processes of one who is offering advice in any area, I pretty much allow anything in good taste to be posted on the list. If someone doesn't have good reasoning abilities in general I wouldn't want to accept their horse knowledge without a lot of questioning. Join the Marv Walker Horses group and you're exchanging information with people with whom you can discuss your horse problems, successes, wishes, exchange ideas and just in general have a good horse time with. 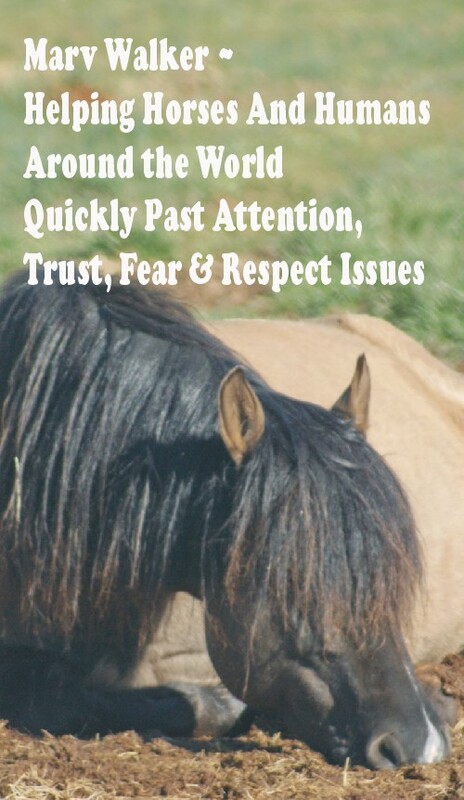 People who want to enhance their horse experiences by freely exchanging information. In July 1998, as the movie "Horse Whisperer" played in theaters, the local paper did a very flattering, rather extensive article about my horse training methods entitled "A Horse Listens (And Speaks)" and I posted a few problem solving suggestions to some problems list members were having on some of the various lists I was on at the time and the next thing you know, I'm being inundated with people contacting me from as far as Australia, The Middle East & Europe. So this list has expanded yet again to become a communication tool for my Mind Meeting Mind In Minutes techniques, as well as all things equine. I'd like you to be a part of it as well. Why not give it a try?